Since 2005 i have been mastering a trading strategy to consistently make money in the stock market. That strategy is what I like to call the Fous 4. Simply because it consists of 4 different highly profitable and consistent breakout chart patterns that can produce some astonishing returns! Each pattern consistantly returns +20% to 100% returns in a matter of a few days to a few weeks! The key to this strategy is to find the right chart patterns to trade. From there it is up to you to trade these patterns successfully. And that’s exactly what i teach you in the Fous 4 DVD. How to identify the right chart patterns and exactly how to trade them using strict portfolio management rules. Ever since i started the premium Black Trades service in 2008 ,which alerts members in real time of all my trades that have consistently returned over +100% annually since inception, there has been a gap in knowledge from the mentor(me) to student relationship. I’ve been trading this strategy for all members to see since i started thiswebsite in 2006. But i have never really gone into depth or explained exactly how and why i make the decisions that I do for all my trades. So Now finally i have compiled a 400+ slide presentation on DVD that will teach you everything you need to know so that we can fill that gap and have everyone on the same page. I can only imagine how strong of a community we will become once everyone fully understands why and how to trade. The collaboration of our minds together could really do some damage in the stock market if all of us work together to find the best trading opportunities! As most of you know. The house always wins at the casino. The same goes for the stock market. In fact only 10% of stock traders ever make money consistently in the stock market and survive. The reason for so much failure in the market is lack of discipline and even more importantly is lack of education. Rather than investing your money in the stock market. You first need to invest your money and time into your education so that you understand how this game works. What better way than to be educated by someone who has mastered a strategy that consistently works and is highly profitable in the stock market?? 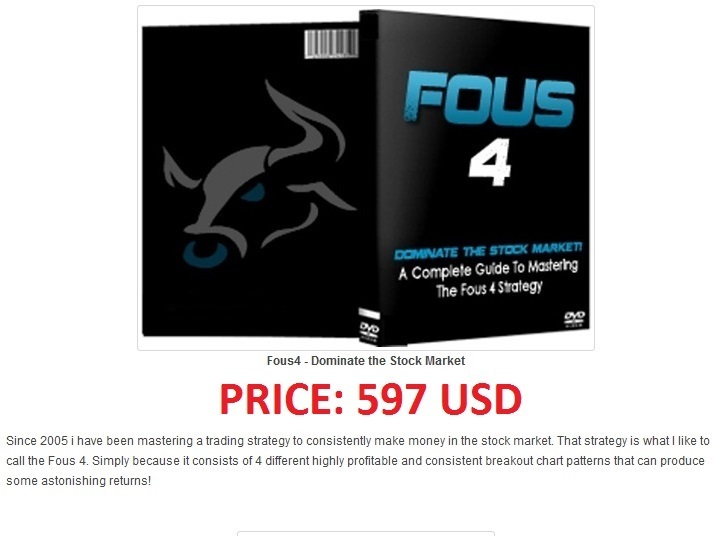 The best thing you could do for yourself to get started in your career as a trader is pick up a copy of the FOUS 4 DVD so that you understand the strategy,psychology, and discipline you need to trade successfully. From there the next best thing to do is sign up for Black Service Stock Picks so that you can now watch a Pro trade this exact strategy and see how its actually done in real time and be used as a guide to your future success in the stock market ! Fous4x2 – Advanced Day Trading Strategies for the Active Trader. In Todays Market. The Typical Investor is DEAD. Since the Crash of 2008 the Stock Market Has Changed BIG TIME. The Volatility of todays market is 10 fold the Pre-2008 days. In order to survive and Keep an edge I had to Re-wire my Brain to be be able to handle the chaos of stocks jumping 20% and crashing 20% in the same day! With The FOUS4x2 Strategy You can Make Thousands in just Minutes! How to Create Daily Watch Lists Of Which are Key to Prepping for success. How To Make $1,000′s in the first couple hours of the Session and be Done! Real Trade Examples Showing how I Banked on FOUS4x2 Patterns!